Kohlberg's Antiques store at 429 17th Street, just around the corner from the Brown Palace Hotel. Kohlberg's Antiques store has early roots in Denver Colorado. Erich Kohlberg's uncle came to America from Austria in the 1870's. He established one of Denver's first curio shops. in lower downtown, I think it was around 1930 when Erich Kohlberg moved to Denver to help manage his uncle's shop. At some point, he became the sole proprietor. Over the years he purchased thousands of collectibles from museums, collectors and from sources all over the world. Kohlberg's Antiques always had a reputation for honesty and offering rare and high quality items. Mr. Kohlberg was an expert in the field of native American artifacts but was also very knowledgeable in many other areas of collecting. In the earlier years it was like a museum, they even had things like armor, Samurai Armor,old swords, daggers and antique guns, all kinds of old original native American artifacts, jewelry, Silver, glass and ancient curiosities from all over the world. In later years they didn't have as many larger items but still continued to keep an unbelievable amount of very rare and high quality antiques. Erich's wife, Paula Ruddick, was originally from Dunfermline Scotland. Her sister, Edith Ruddick was a well known Scottish actress. Paula Ruddick met Erich on a transatlantic cruise sometime in the early 1950’s and they later married. They both managed the store and were a great team! I was just a kid when I first met Mr. Kohlberg, My mom worked at the Kohlberg's antiques store in the 1960's and 70's. and she became friend of the Kohlberg's. She did research, restoration, and sales for the store. She enjoyed working there and met a lot of interesting collectors, including Vincent Price. My sister also worked at Kohlberg's in the 70s. Sometimes I got to visit the old store on 17th street and I was exposed to all these wonderful old things, All these old things made an impression on me, drew me more into past history and art through the ages. I wanted to start collecting too! Around the age of 14, I started collecting old things as a hobby, mostly military items from WWI and WWII but many other things too! Mr. Kohlberg died in the 1970's but Mrs. Kohlberg continued to run the store for many years. Paula Kohlberg died in 1995. They were a great team, respected by many and had a wide variety of customers from around the world. 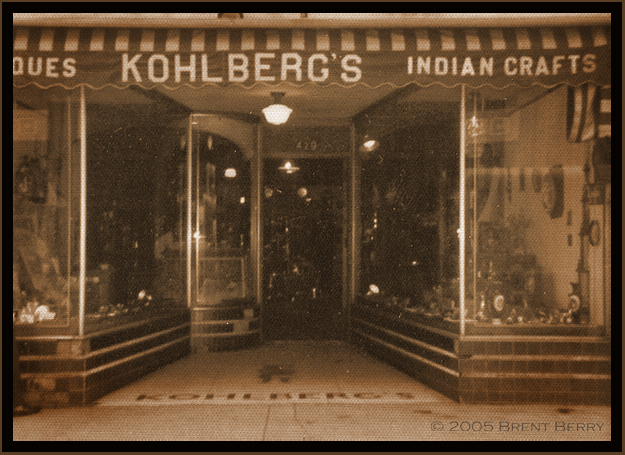 I have very fond memories of the Kohlbergs and their store, these memories have contributed to my appreciation for culture and history. The Kohlberg's, their history and exposure to their antiques and collectibles, have left lasting memories with me and have had an influence on me, and even on my artwork. I've searched through some of my old Denver city directory books and found these listings. They show some of the different locations of the Kohlberg's store over the years. 1915 - "Kohlberg's Big Curio Store" 501 17th Street. Also "Kohlberg Manufacturing & Import Co" at the same address, Morris J. Kohlberg, Manager. I think this may have been Erich's uncle. I don't know what year they moved to the Champa location but it was the store's last location in Denver and it closed after Mrs. Kohberg died in 1995. The Kohlberg family continued operating the business in the UK for some time but the business closed years ago. Kohlbergs Antiques of Denver is long gone but Kohlberg's will always be a part of Denver's history and will be fondly remembered by many people.